Purium’s L.O.V. 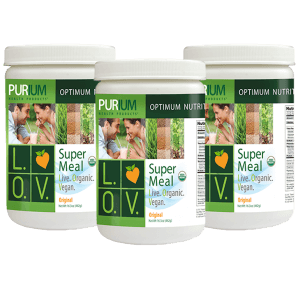 Super Meal™ is composed of 36 pure, premium, natural, whole food ingredients. It contains 12 green foods, 10 vegetables, 9 sprouts, and 5 mushrooms – and only 2 grams of naturally occurring sugar. It also has 20 grams of vegan protein from organic fermented rice, 9 grams of fiber, and more antioxidants than 10 servings of fruits and veggies! Purium’s new L.O.V. Super Meal was recently endorsed by the Diabetes Resource Center! 20 Day Continuation Cleanse: $107.15 retail or $75.00 as a member. Do you want some L.O.V. in your life? If you are ready to make a life change and detox your body of GMOs and processed food toxins and lose weight as an ancillary benefit , click below and click “Verify” to redeem my gift of $50 to you!